Step 1: Use a comb to create a side part. Step 2: Apply Volumizing Mousse. Step 3: Using a curling wand to create loose curls, leaving ends smooth. Step 4: Use Volume Styling Spray on top, close to the roots and along the part. Step 5: Create volume by flipping hair and combing. Set in place with a large clip. 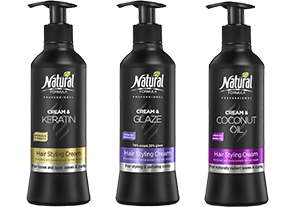 Step 1: Apply Cream & Glaze on damp hair, for hydration and radiance. Step 2: Blow-dry hair using a diffuser. 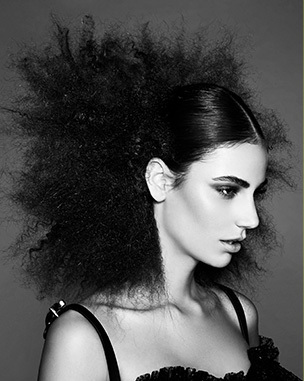 Step 3: Using a wide-toothed comb, tease hair by pushing it close to the root to create more volume. Step 4: Loosen curls with fingers. Step 5: Lock in look with Holding Styling Spray, to protect hair against humidity. Step 1: Apply Curl-Sculpting Mousse and scrunch hair to build a mass of curls. Step 2: Gently blow-dry hair using a diffuser. Step 3: Apply Cream & Glaze to tips for perfect, radiant curls that will last throughout the day. Step 2: Apply Professional Glaze and create a line of small pony tails. Tightly twist into small braids creating wide parts between them. Step 3: Collect the rest of your hair and roll it towards the center for an upside-down banana look. Hold in place with bobby pins. Step 4: Use Holding Styling Spray to lock in place. Step 1: Straighten hair to ear length. Step 2: Apply Volumizing Mousse to build volume from ear length to tips. Step 3: Using a curling wand, create curls from ear length to tips. Step 4: Spray crown of head with Volume Styling Spray to lock in place and brush. 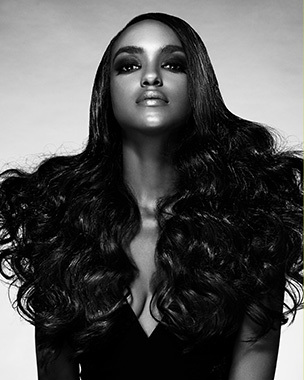 Step 5: From ear length to tips – open curls and use Volume Styling Spray to lock in curl volume. 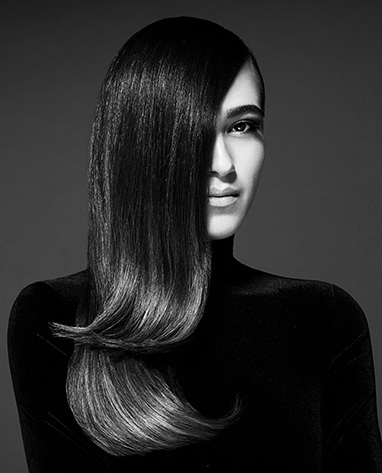 Step 1: Apply Keratin Intense Heat Protection Cream and blow-dry hair, parting hair into sections. Step 2: Tease hair at the crown of the head to create volume. 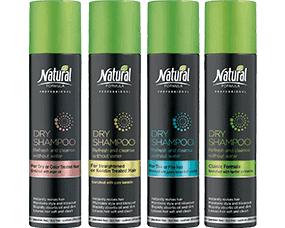 Use Holding Styling Spray to set. Step 3: Take the entire front section of hair and create a puff at the top front of head. Lock in place with Holding Styling Spray. Step 4: Reach for baby hairs and flyaway strands and place them in front of ears. Step 1: Blow-dry hair straight. Before blow drying, apply Keratin Intense Heat Protection Cream to protect hair against heat and for best straightening results. After drying, make a tight ponytail. Step 2: Apply Volumizing Mousse to ponytail and make tight braids — as many as possible. Step 3: Run a flat iron over braids. Step 4: Wait until hair cools, and undo braids. Step 5: Tease hair to give ponytail lots of volume. Step 1: Blow-dry hair and part into sections. 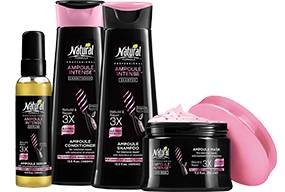 Before blow-drying apply Keratin Intense Heat Protection Cream to protect hair against heat and to achieve best straightening results. Step 2: Take bottom section of hair and curve ends inwards using a large professional blowout brush. Continue blow-drying. Step 3: Take top section and flip outwards to create a big curve. Step 4: Apply a few magic drops of Keratin Intense Serum for soft and radiant hair. 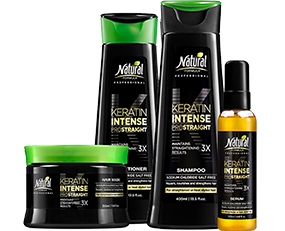 Step 1: Apply Keratin Intense Heat Protection Cream to protect hair against heat and to achieve best straightening results. Step 2: Use a curling wand to curl hair. 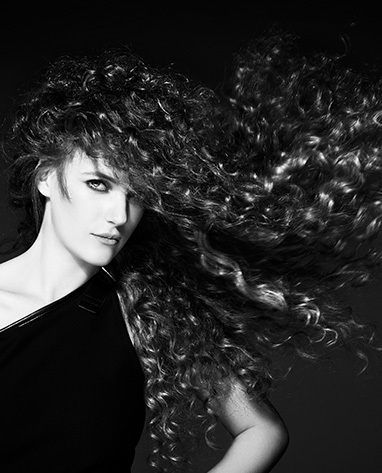 Step 3: After creating each curl, use Volume Styling Spray to seal in place. Step 4: Using a paddle brush, gently brush out curls. Step 5: Use Volume Styling Spray to lock style into place for the entire day. Step 1: Curl dry, straight hair with a curling wand. Step 2: After creating each curl, use Volume Styling Spray to seal. Step 3: Using a wide hair brush, gently brush out curls. 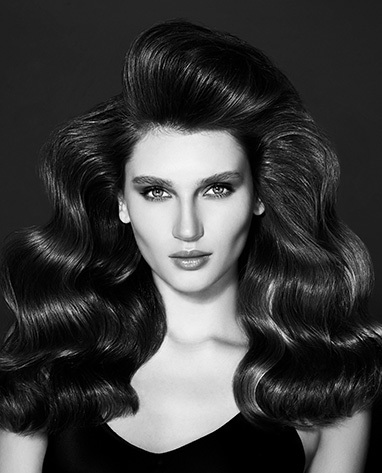 Step 4: To create the large wave at the front — tease hair with teasing comb, combing hair towards the roots. Step 5: Use Holding Styling Spray to prevent frizz and static, and to lock style in place for the entire day. Step 1: Blow-dry hair straight. Step 2: Using a teasing comb, part hair on the crown of head and on the sides. Step 3: Tease hair to create volume and lock in place with Volume Styling Spray. Step 4: Use a brush to gather hair into a low ponytail. Step 5: Apply Ampoule Intense Serum to ponytail for softness and radiance. Step 1: Blow-dry hair straight. Before blow-drying, apply Keratin Intense Heat Protection Cream to protect hair against heat and to achieve best straightening results. Step 2: Gradually take groups of hair bringing them forward to create an upside-down braid at the front. Step 3: Brush out waves. Step 4: Secure in place with hair pins. Step 5: Use Holding Styling Spray to hold style in place all day.